It was Franz Liszt who set the conventions for the modern piano recital, which have not changed in many decades. A program tells the audience what it will hear; there is almost always an intermission which is preceded perhaps by some lighter fare (Mozart, early Beethoven) and followed by more substantial music (late Beethoven, the big romantic warhorses). Very modern or unusual music normally is confined to the first part of the recital. Usually, there is an encore(s), consisting of flashy virtuoso material, or a melodic, crowd-pleasing material. The pianist does not speak to the audience, or if he or she briefly does, it comes at the very beginning or end of the recital. 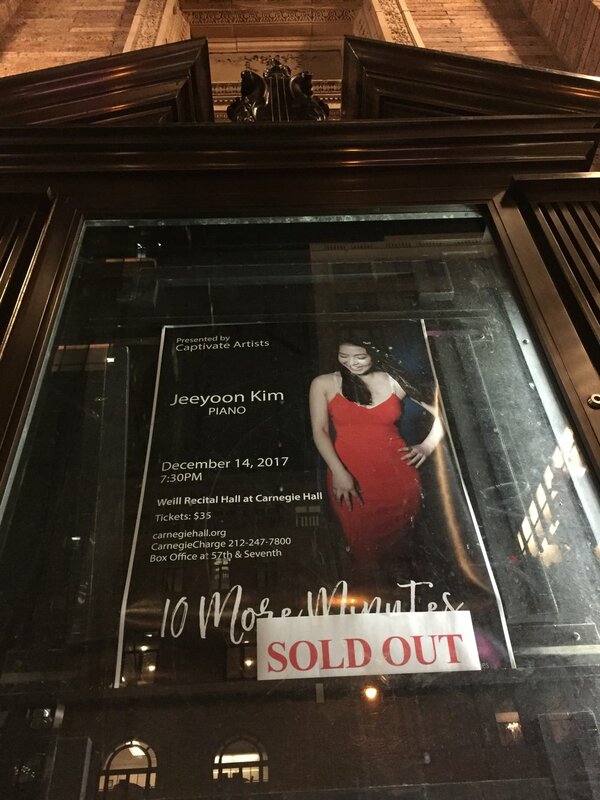 On December 14, Jeeyoon Kim gave a recital in Weill Recital Hall at Carnegie Hall which broke most if not all of the basic rules of the piano concert — except one: that the audience be given an utterly sublime musical experience and leave the hall in a state of bliss. For starters, Kim did not give the audience any program telling it what it would hear. Nor was there to be an intermission. There was a microphone set up on stage, leading the audience to assume (correctly) that it would find out what was to be played from Ms. Kim herself. But as it turned out, the audience learned a lot more from Ms. Kim than just the titles of the pieces. A recital called “10 More Minutes” is, as you might expect, devoted to pieces that might be played as encores – in that last ten minutes of a recital. But for Ms. Kim, encores focus neither on virtuosity nor crowd-pleasing but invoke a sense of nostalgia. They are meant to invoke that limenal feeling of being at the end of the concert, a feeling which combines reflections on the beauty you have experienced and the pain of loss that it is about to go away. For Kim, encores provide a sensation somewhat like that moment when you awaken from a beautiful dream: you still are wrapped up in the wonderful, warm emotions of the dream but you have to face the hard, waiting world which you feel coming. If these descriptions seem to you to run the risk of banality or sentimentability, then you were not at Ms. Kim’s recital. Ms. Kim is unsurpassed in her ability to communicate without sentimentality the emotional core of the music she plays. Her words and her playing reinforce each other, taking the listener into the very soul of the music. Courage is not a word normally applied to musical performers, but Ms. Kim is courageous, in being willing to engage in this degree of self-exposure before a hall full of strangers. I have not talked yet about Ms. Kim’s playing per se, but her technical ability puts her in that class of contemporary pianists who are being called “hypervirtuosos” (Marc-Andre Hamelin is usually cited as the main example). Ms. Kim plays at that level where she becomes part of the piano, and there is no sense of strain in their relationship. But there are many technically gifted pianists these days, and that is not the reason one would go to a recital by Jeeyoon Kim. Indeed, she can, and did, play a Scriabin Etude, Debussy’s Estampes and Schubert’s Impromptus, as well as any one. But we would go to a recital by Ms. Kim for something else, something which today gets rarer and rarer: an experience of shared feeling, of that impersonal intimacy that music can provide. In that sharing we find ourselves. 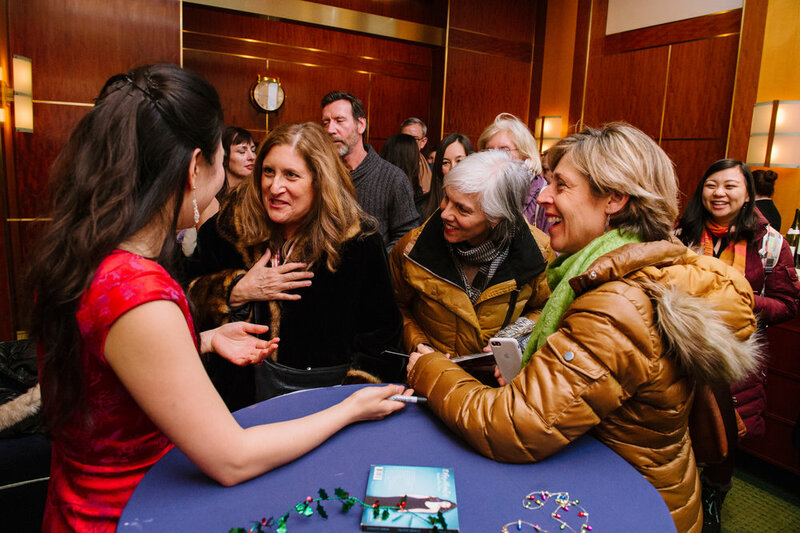 At the end of Ms. Kim’s recital, the audience exploded in rapturous applause. No one wanted to go out into the bitter cold of New York’s winter, but everyone felt better, feeling that we could take some of Jeeyoon Kim with us. Written by Paul Gudel, a former classical music concerts reviewer for the newspaper at Northwestern University in Chicago, a current law professor at California Western School of Law. Album Review: "10 More Minutes"